One of my family’s most successful activities this past summer was a kid swap: I sent my younger son to play at a friend’s home, while the friend’s older brother came to play with my older son at our home. Both of the older brothers have special needs, but it was easy to supervise them, because they share a common interest: building with Legos. Within an hour, we had one finished castle and two smiling boys in the living room. 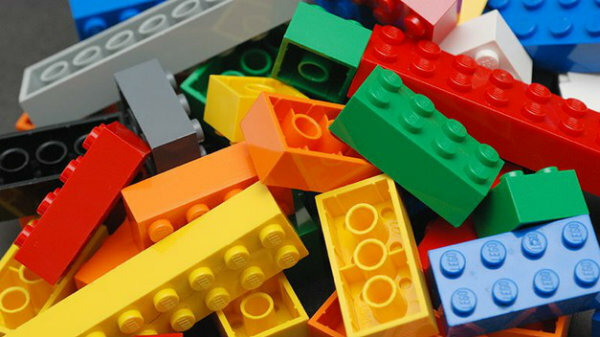 Building with Lego bricks is a multi-sensory, open-ended experience, so the building projects can be tailored to any person’s unique needs, such as blindness, deafness, mobility impairment, autism or ADHD. But the format for most Lego therapy programs is the same. Participants suggest and agree upon simple rules that everyone understands. The group agrees upon a project that is not too easy and not too difficult. The rules are posted as a reminder. If that seems too ambitious, start with just one or two elements of play therapy and gradually expand the repetoire. The great thing about Legos is that you can start from scratch at any time. you can follow an instruction booklet, you can improvise the whole project, or you can do a little of both. At our home, we usually start by building a project exactly as it is shown in the booklet, then we customize it and mix it with other kits – going wherever inspiration leads us. Emotions can run high during a Lego project. There’s usually one person who insists on doing things in the “right” way, and another person who loves to try things several different ways just to see how each one looks. An adult facilitator can support positive interactions, suggest compromises, provide prompts as necessary and keep the group on task. Lego offers free apps that allow virtual building. Bricks & More is an app for the iPhone, iPad and Android, approrpiate for ages 4 and up. Lego Digital Designer is an app for PC or Mac for ages 5 and up, and users can share their creations (with building instructions) on the Lego website. It’s a great introduction to computer-aided design. Master Builder Academy (MBA) is an online training program for advanced builders – sign up for a free trial here. Lego therapy got started because therapists noticed that children and adults naturally gravitated toward Legos in a room full of toys. It’s a fun way to build upon existing interests and emerging skills – and the possibilities are endless!